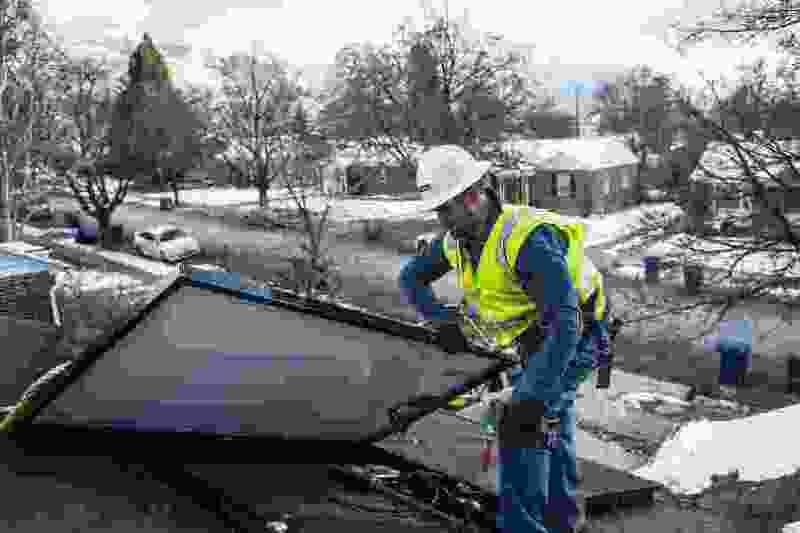 Rocky Mountain Power helping to restore Utah tax breaks on solar panels, but is the utility just looking out for itself? (Chris Detrick | Tribune file photo) Creative Energies lead electrician Justin Therrien installs solar panels on top of a home in Salt Lake City, seen in 2016. Rocky Mountain Power is backing solar industry advocates’ push to reinstate Utah’s system of residential solar tax credits, but that doesn’t mean the utility and solar supporters are getting along. After years of discord, Rocky Mountain Power is siding with solar industry advocates’ in a push to reinstate Utah’s residential solar tax credits. But tensions have already emerged between the unlikely allies. If you ask Rocky Mountain Power, Utah’s largest provider of electricity, the company fully supports a bill on Capitol Hill that would preserve the popular tax credit on residential installs for a few more years. The utility agreed to lobby for the tax credits as part of a 2017 settlement that ended its prior system for reimbursing solar panel owners for surplus electricity they generate, known as net metering. The carefully crafted settlement also requires Rocky Mountain Power to help make up the difference — should lawmakers withhold state funds for restoring tax breaks on solar installations, which they voted to phase out last year. That promise, officials with Rocky Mountain Power and the Utah Solar Energy Association agreed, was key to sealing the 2017 deal. Solar advocates, Evans said, figured that the tax credits would help offset some of the gains new solar customers would lose under the settlement terms. Rocky Mountain Power similarly agreed the tax credits would be an “appropriate” way to incentivize solar energy production in Utah, said Jon Cox, vice president of government affairs for the utility. So the company has committed to help, lending its considerable lobbying power to the cause. The utility isn’t doing this entirely out of the goodness of its heart. The tax credits would come out of state coffers — an expense Gov. Gary Herbert views as money well spent, according to his Office of Energy Development. And if the allies do not succeed in preserving the tax credits, Rocky Mountain Power has agreed to pay new solar customers more for their excess power. The utility, Cox said, is “very optimistic” that the tax credits will be restored. Indeed, the bill ratifying terms of the settlement is already on its way to the full Utah Senate with no obvious opposition — after it draw a unanimously favorable recommendation Wednesday from the Senate Business and Labor Standing Committee. SB141, sponsored by Sen. Curtis Bramble, R-Provo, would extend the phase-out of the tax breaks through 2023, two years past their current expiration of 2021. Rocky Mountain Power, state regulators and other parties have said they will use the two-year extension to negotiate a permanent rate at which the utility will reimburse solar households for excess electricity. Residential customers who install solar in the meantime will get credits worth 9.2 cents for each kilowatt hour of electricity. Should the tax credit initiative fail, Rocky Mountain Power will up the value of the transition-period credits to 9.4 cents. Net-metering customers who were grandfathered into the old arrangement per the terms of the settlement get credits worth roughly 10 cents. But as the tax credits are advancing in the Utah Legislature, Rocky Mountain Power has proposed a separate bill that has the solar association bristling. HB261, sponsored by Rep. John Knotwell, R-Herriman, would allow Rocky Mountain Power to bid on its own proposed solar-energy projects, enabling the utility to claim sizable federal tax credits. Currently, only private solar-installation contractors are eligible to claim those federal tax credits, so most utilities and other business hire private firms to build solar projects on their behalf. Those contractors then claim the tax credits as their own. But if Rocky Mountain Power were able to claim those tax credits itself, Cox said, it would lower the cost of new solar projects — and the utility could provide more clean energy to its customers. Evans, however, is skeptical. He said the bill looks like it could allow Rocky Mountain Power to undercut private solar installers, pushing them out of the market for large, commercial-scale projects. That, in turn, could raise prices and possibly even decrease the amount of solar installed in Utah, Evans said. “We just want to make sure that private industry, which has done a really good job of bringing competition that brings down the price of solar, still has opportunity,” Evans said. Even so, Evans said, the solar industry now has a good working relationship with Rocky Mountain Power, and is currently talking with the utility about possibly revising the bill. Cox confirmed that Rocky Mountain Power is working with the solar industry to build consensus about the federal tax credits issue.